Seems like there are new products for AR’s being introduced daily. Not all of them are good, but some are great. So, I have three products to recommend, two fairly new and one oldie but goodie. When it came to ergonomics Eugene Stoner was a genius. The AR has all its essential components – safety, mag and bolt release – in just the right place. On the original rifle Stoner used triangular handguards. The triangle shaped fits the shape of your hand nicely, and the flatter bottom helps when you’re resting it on something, like bracing for stability and accuracy. I have several rifles with them and really like ’em. The problem with the original design, due to the material they are made from, is they break or crack easily. Precision Reflex, Inc. now offers their Gen III Delta shaped forearm that is free floated, set up with rails, and constructed from carbon fiber, which makes it virtually indestructible. The triangular shape works with gas or piston guns. 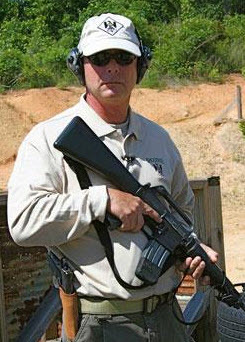 They offer three lengths – carbine, mid-length, and rifle – with picatinny rails positioned on the top, sides, and bottom that are easily removed if you want. If you’re going mount one of these handguards be sure to get the proprietary wrench needed to torque the barrel nut. I like fixed stocks, particularly the A1 stock, which is 5/8 of an inch shorter than the A2 version. 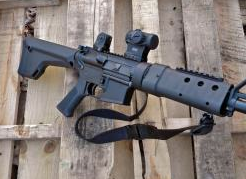 Now, Magpul has their MOE fixed stock, (Brownells 100-009-585) which is close to the length of shorter A1 stock but with an enlarged area for an improved cheekweld. Snap the muzzle up, hit your cheekweld and you’ve got a sight picture. It has a small storage compartment and a variety of points to attach your sling. It also looks cool, which is always an advantage and may just improve your accuracy. They will soon have this same style stock set up to fit an adjustable stock buffer tube that will allow you to use one buffer tube for fixed and adjustable stocks. The extractor spring on the AR is obviously an important part, and over the years there have been many variations offered. I’ve tried a lot of different type springs, even the chrome silicon versions – and I’ve ended up having all of them break before they should. Now, I’ve sworn off everything except Colt’s “gold” extractor spring (Brownells’ 160-304-025). Colt went through several different versions of springs and plastic inserts, eventually settling on the “gold” spring around 2003. This spring provides reliable and effective performance in both rifles and carbines. Rifles are very personal weapons, and with the variety of parts available today there is no reason not to have one that fits your needs. Just keep in mind the deciding factor in choosing parts is your intended application of the weapon. Once you’ve figured out what you need then spend plenty of time practicing so you know how it works.